The WY series of waterproof connectors from Weipu are ruggedly built with bayonet couplings and sealed to IP67 for metal cable clamping nuts, IP65 for plastic cable clamping nuts and angled plugs or IP55 for plastic hose models. They can be used in-line with cable to cable connections or for cable to panel mount connections, with a choice of either end been a male or female connection. The WY series of waterproof connectors from Weipu are ruggedly built with bayonet couplings and sealed to IP67 for metal cable clamping nuts, IP65 for plastic cable clamping nuts and angled plugs or IP55 for plastic hose models. 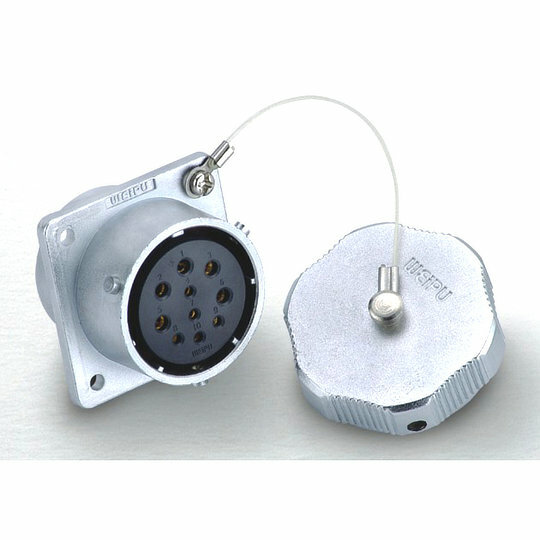 They can be used in-line with cable to cable connections or for cable to panel mount connections, with a choice of either end been a male or female connection. Available for panel cut-outs of 16.5mm, 20.5mm, 24.5mm, 28.5mm, 32.5mm, 40.5mm, 48.5mm and 55.5mm with a choice of between 2 pin up to 61 pin gold plated contacts with either solder, screw or crimp style terminations. The WY series offer round or square flange style panel connectors and straight or angled cable connectors giving a large variety of options for nearly every application. Perfect for outdoor power or data applications including Outdoor Lighting, LED Screens, Outdoor Security Cameras, Solar Energy, Medical Devices, Marine Equipment and Industrial Control Systems.